In this case, two brothers marry two sisters from a different family. 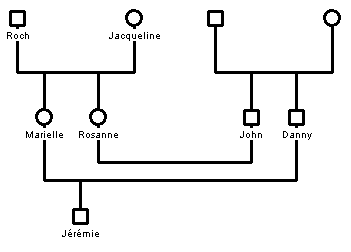 In this example, the two brothers are John and Danny and the two sisters are Marielle and Rosanne. This is the same very similar to a marriage between cousins. You use the mouse to select simultaneously the husband and the wife, and you invoke the Family Wizard. As soon as you click on the OK button of the Family Wizard, you have created a union between the husband and the wife. All tutorials are included in the sample file.